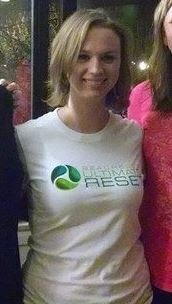 Today, I enter the final week of the Beachbody Ultimate Reset – the Restore phase. During this phase, I’ll be eating mostly fruits and vegetables that are easily absorbed by the body for optimal nutritional value. I think grains are completely cut out of the diet. This phase comes after the detox phase, and it helps bring healthy bacteria back into your “freshly scrubbed” digestive tract by introducing pre- and probiotics to help restore the metabolism to maximum efficiency. This is accomplished through the final supplement – Revitalize. Revitalize comes in a capsule form, and its consumed three times a day. While I am on the topic of supplements, I ran out of Mineralize yesterday. Since Mineralize is only pink Himalayan salt, I just went out to the grocery store and bought some. But, for those of you who don’t have the luxury of an organic supermarket in the neighorhood and need to send away for these things, make sure to have some extra pink salt on standby in case you run out. This morning, I decided to try something new. My usual morning routine outside of the Reset is a 30-60 minutes workout, usually something intense, like Insanity, to help wake me up and get my blood flowing in the morning. I’ve never been a morning person, so, to me, this is essential to be minimally pleasant before noon. On the Reset, you are not permitted to workout because your body is receiving such an intense inner body workout. Plus, I don’t think you’re really consuming enough calories to really support your body during intense training. Exercises like yoga, tai chi, stretching, and brisk walking are fine, but no Insanity, unfortunately. This was one of the big adjustments for me, and I was skeptical whether I would be able to survive mornings without the jolt of adrenaline first thing in the morning. Somehow, I’ve been surviving. I’ve been doing free yoga videos that come on Xfinity On Demand. They’ve been great, but I really missed Shaun T. Today, I remembered that there are Recovery workouts that come with Insanity that I could do. It would probably be a step up intensity-wise from the yoga I’ve been doing, but I was willing to try it. Well, when I do Insanity, I normally substitute Core Cardio and Balance for the Recovery workout, because the Recovery workout is just too easy, doesn’t make me sweat, and isn’t enough to get my blood pumping in the morning. Well, this morning, it got the blood pumping, and I was even sweating. My muscles were literally shaking during some of the moves. My legs are already feeling sore from this morning. This makes me nervous about starting Focus T25 after the Reset is complete, but I’m going to jump on it anyway. Also, this morning, I weighed myself for the second time of the Reset. I’m down 2.4 pounds since day 8. That means I’m down 4.4 pounds in only 15 days! Not bad for a 5’2” tall chick. During the final week of the Reset, breakfast is fruit only. 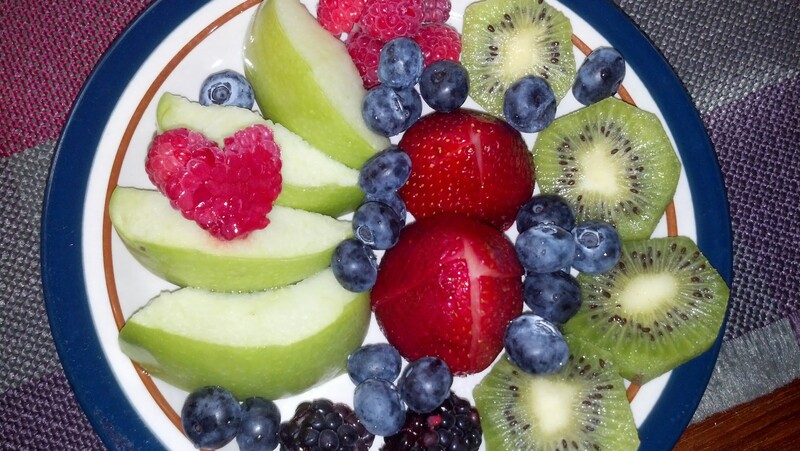 You’re supposed to choose low glycemic fruits, like berries, and avoid tropical fruits like bananas and pineapples. I’m skeptical of the ability of fruit to keep me satisfied until lunch, but I guess it worked today. One of my raspberries was shaped like a heart, which made this first day of the Restore phase extra special. Last night, I prepared lunch for today – an Asian “cabbage” salad, 1/4 sliced avocado, and miso soup. I put cabbage in scare quotes because I didn’t have cabbage. Unfortunately, the labels in the grocery store produce aisle weren’t accurate, and my husband picked up mustard greens instead of napa cabbage. It’s okay. We’ll make do. We had some extra Romaine lettuce, so instead of cabbage, I chopped up some Romaine and used that instead. This lunch had a lot of onions in it. 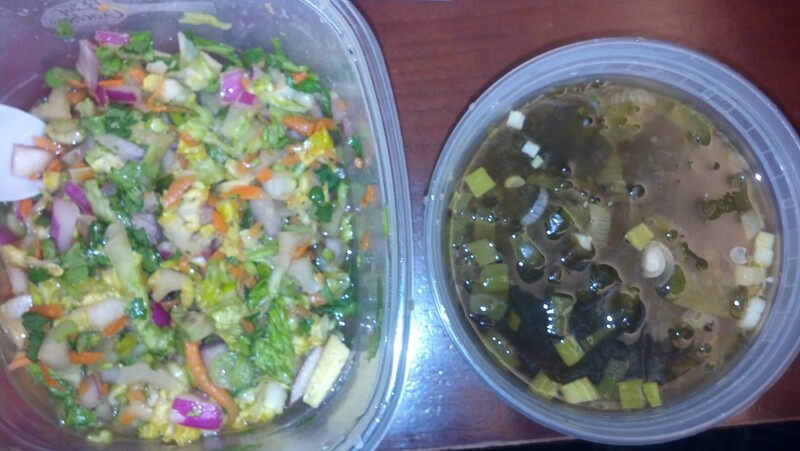 The Asian salad had both raw red and green onions, and the miso soup had green onions. I had to run to back-to-back meetings in the afternoon, and was so tempted to grab some gum or a hard candy to get the taste/smell of the onions out of my mouth. Well, none of that is allowed on the Reset! I chewed on some herbal tea leaves (it was all that I had in the office), and that helped a little, but I still felt bad for all who I came in contact with this afternoon. Dinner was awesome! And by “awesome,” I mean baked sweet potato awesome! Against my better judgement, I’m a huge fan of carbohydrates. I was very happy to see a baked sweet potato on the menu for dinner. I’ve actually never baked a sweet potato before. It was heaven. I’ll definitely be doing that again. 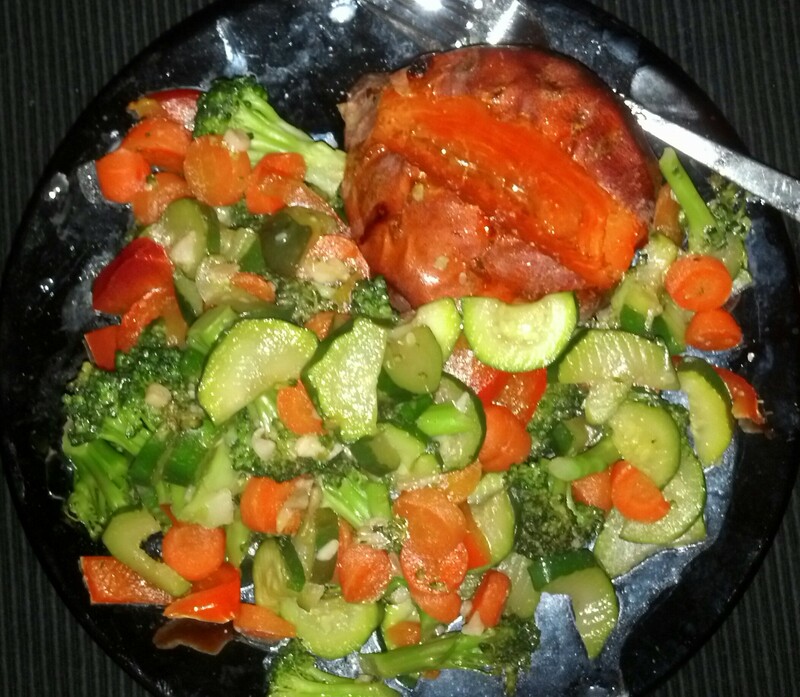 The sweet potato was accompanied by garlic veggies – broccoli, carrots, zucchini, and red bell pepper sauteed with garlic, lemon, olive oil, and Bragg’s Liquid Aminos. They were fine. The sweet potato stole the show. Everything that I’ve been hearing and reading about the Beachbody Ultimate Reset says that days 3 through 5 are the most challenging. Beachbody recommends starting the Reset on a Wednesday specifically so that you can avoid these difficult days falling on work days (Monday through Friday for most folks). I am almost done with day 5 and have not really felt particularly challenged yet. I went into the Reset knowing that I would be saying no to drugs and alcohol for 21 days (drugs = caffeine. Why, what were you thinking?!). Resisting caffeine and alcohol is more of a psychological shift than a physiological pain for me. Despite the fact that I would drink at least one cup of coffee during work days and pump up on Redbull on the weekends, I haven’t really experienced any caffeine withdrawal. While I would like to be drinking alcohol on Friday and Saturday nights (especially outside on nice days like we’ve had in DC this weekend), I can resist it. I think that days 3 through 5 might be really hard for people who are coming into the Reset with real addictions to things like caffeine and sugar, and for people who are making drastic dietary changes. Pre-Reset, I normally ate things like quinoa and seaweed (think: sushi, miso soup), and stayed away from sugar and fast food. So, I’m lucky in that this isn’t that hard (so far!). The hardest part for me has really been the planning. 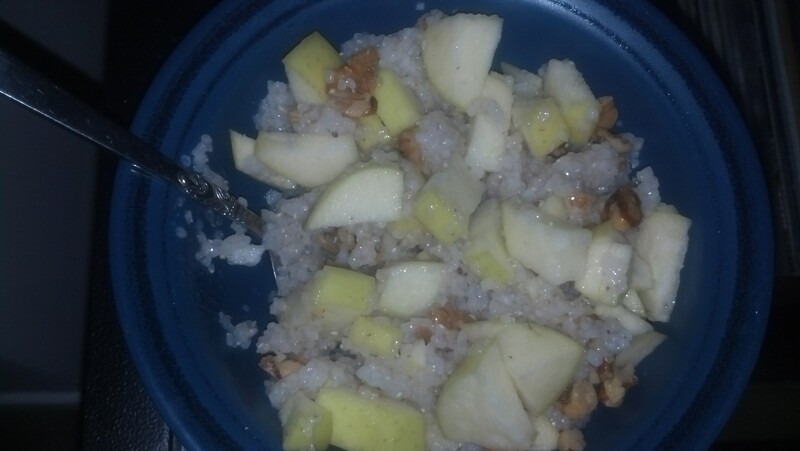 Day 5 breakfast was supposed to include farina with walnuts, apples, and maple syrup. Now, when I went grocery shopping according to the grocery list the Beachbody compiled for week 1, “rice cereal” was on the list but “farina” was not. As a result, I ended up buying a hot brown rice grits-type cereal, not actual farina. I doubt it’s a big deal. Also, instead of maple syrup, I used raw agave nectar because I opted not to spend the money on maple syrup that it didn’t seem like we really used that much throughout the program. It turns out maple syrup is used a lot more than agave nectar, so I am kind of regretting that choice. But, boy, is agave nectar delicious! Can’t say I mind much. 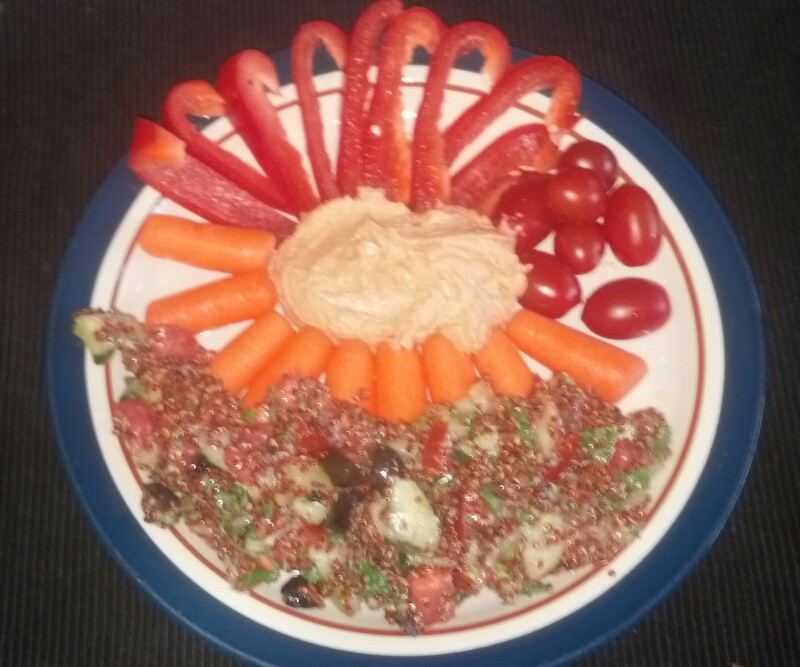 Lunch included a quinoa salad and hummus and raw veggies. I love hummus, so I was very happy to see that the recipe called for a whopping 1/2 cup of hummus! I was a pretty happy girl for lunch. The Reset recipes are slowly taking out animal proteins. In retrospect, I don’t think that I had any today (unless there was something in the hummus). It’s really amazing how veggies can fill you up until dinner time, which I will be having soon. Today was another beautiful day in the District, so my husband and I went out for a couple of nice long walks. You are not permitted to do strenuous workouts during the Reset – only walking, yoga, tai chi, or stretching. Since I am used to doing high-intensity cardio workouts (Insanity is one of my favorites) in mornings before heading into the office, this is a big change for me. On day 1, I tried the Tai Cheng sample workout that comes with the Reset DVDs. Tai Cheng is basically a low-impact Tai Chi program developed by Dr. Mark Cheng. 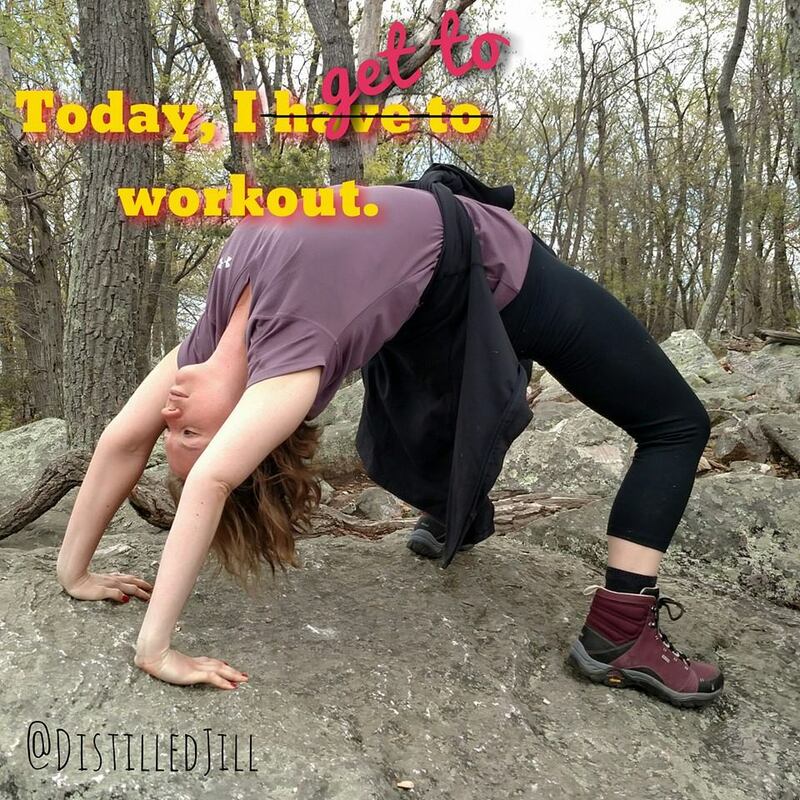 While I could see the value of the workout, it was really putting me to sleep first thing in the morning, and I preferred the 20-minute yoga workout that I did the following day. The sun salutations really helped wake me up a little bit in the morning, and since I perpetually drag early in the day, that’s essential for me in a morning exercise routine. Did I sweat? No. Did my heart rate go up? No, not really. I can’t wait to go back to my normal exercise routines after the Reset. My goal is to begin with Focus T25, then do Insanity, and then Insanity the Asylum. I already own and have completed each of these, but I feel like I will really get the most benefit out of them doing them in sequence again after the Reset. I’d say the next 5 months are pretty well planned. Can’t wait! The final meal of today is miso soup (my husband’s specialty! ), stir-fried veggies, brown rice, and nori gomasio. I made an extra batch of stir-fried veggies last night, have a big batch of brown rice in the fridge, and a bunch of nori gomasio, so my evening looks pretty easy! I’m going to go start prepping for tomorrow now. No rest in the Reset. 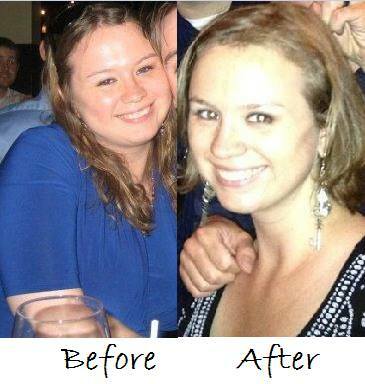 Ever hear of the Beachbody Ultimate Reset? It’s scary. I’m horrified. It’s only appropriate to name this blog, which will document my progress through the 21-day presumed horror that will be the Ultimate Reset, after a classic horror movie. Based on what I’ve heard about the Ultimate Reset, it could easily be classified as the “demon to some; angel to others” that “will tear your soul apart.” Okay. Enough with the regurgitated cheesy “Hellraiser” taglines, what is the Beachbody Ultimate Reset? As its Program and Nutrition Guide describes it, the “Ultimate Reset is not just a cleanse or detox . . . It’s a no-starvation, multifaceted, life-changing, cutting-edge, ‘this-is-the-real-deal,’ inner-body tune up.” It cleanses your body, helps you eliminate waste, naturally and gently detox your body, and helps maximize energy production within your cells, and improve your ability to process fuel from nutrients. Its three phases over 21 days include daily meal plans full of organic and unprocessed foods, a strict supplement regimen, and nothing else to drink but distilled water. In the end, you’re supposed to feel better and be healthier than you ever have in your whole life – energized and renewed. Sounds great, huh? Yes, except it’s the process of getting there that scares me. I am a foodie, and I love trying trendy new restaurants and avant-garde meals from celebrity chefs. I love caffeine in all of its many forms – coffee, tea, No Doz, you name it. Another love? Alcohol. Red wine, white wine, craft beer, craft cocktails, champagne, tequila, gin, vodka – shake it, stir it, blend it, shoot it, all of it. Despite these damning indulgences, I am no stranger to health and nutrition. I do not eat much processed food or fast food. I avoid things like butter, sugar (I am blessed not to have much of a sweet tooth), and pasta; and instead regularly eat things like quinoa and kale, and drink Shakeology every day. I try to balance my unhealthy habits with super strenuous exercise and fitness regimens (ever hear of Insanity?). And while I have lost 40 pounds since graduating from law school about 3 years ago, my body is not where it should be. I crave more energy and mental clarity. I drag in the mornings, and my brain constantly feels fuzzy (and no, it’s not from alcohol, I don’t normally drink during the week). I’ve struggled with my metabolism my whole life. I also know that I need to take better care of myself due to family histories of obesity, diabetes, and high blood pressure. That’s where the Ultimate Reset comes in. Phase 1: Reclaim. You remove foods, such as red meat and dairy, that place stress on the digestive system. Phase 2: Release. Fully vegetarian diet. You release the toxic compounds that are stored within your tissues, clogging your cells, and blocking proper nutrient absorption. This phase includes a gentle colon cleanse. Phase 3: Restore. You restore your metabolism to maximum efficiency and eat mostly fruits and veggies. During each phase, there are supplements that you take. 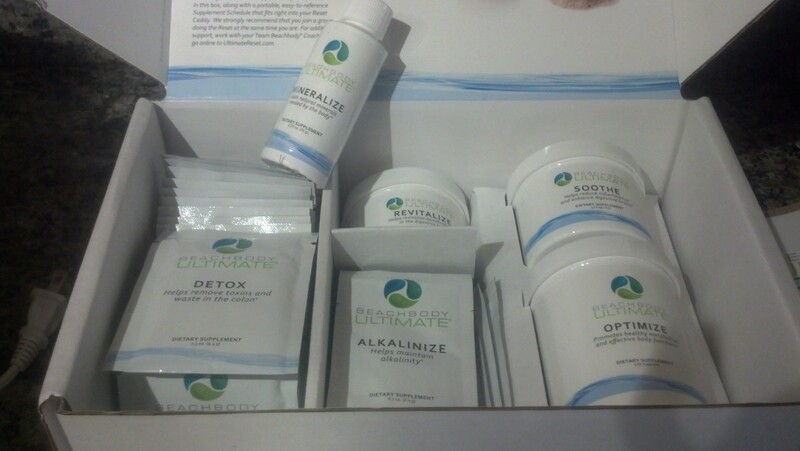 These include Detox, Revitalize, Alkalinize, Mineralize, Optimize, and Soothe. My Start Date: Wednesday, February 17. 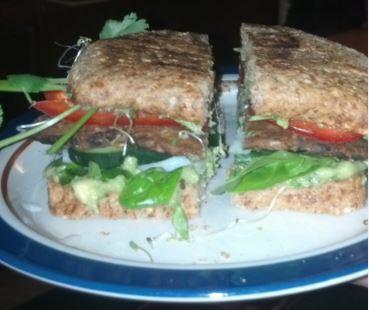 I will try to document as many days of the Ultimate Reset as possible. My husband will also be joining me for the Ultimate Reset, and I will be sure to post stats and comments about both of us. My hope is that my journey through the program helps others decide whether this is something appropriate for them, and also to inspire others to take control of their health. Wish me luck!